I noticed something the other day. Shane was home for lunch hour and after eating his lunch he sat back and closed his eyes. He looked…sick. He didn’t look like that before he ate lunch. And on his plate…grease smears leftover from his lunch. Gross. He came in feeling good then I fed him something that left him feeling gross, heavy, tired, and even sick. I have been spending so much time lately focusing on healthy snacks and healthy suppers but I had never even thought about healthy lunches for Shane. He loves fries, chicken fingers, wings, etc (don’t we all?) so I assumed these would make good lunches. Quick, easy for me to make, too. Mistake. Cut chicken into cubes and either fry them or boil them(I boil them in the beginning of the week and have them in the frig on hand for any lunch). Heat up frying pan (cast iron works best but use what you have!) and lightly spray it with oil. Once it is heated but not too hot put the tortilla in the pan and sprinkle the cheese and chicken on one half of the tortilla. 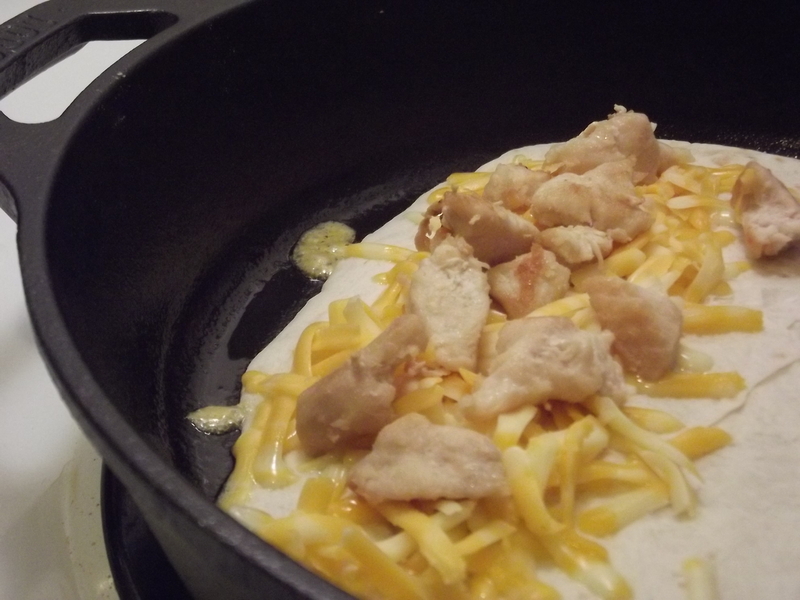 and flip the empty side of the tortilla onto the chicken and cheese. Let that sit for a minute…just long enough for the melted cheese to stick to both sides then flip it over. One minute on that side and it is ready! I have made this with regular flour tortillas and also gluten free corn tortillas. It worked great with both. I would like to fill my recipe box with a lot of healthy lunch ideas. Share your favorites with me! One thing Mike and I have done is to make mini “pizzas” using tortillas. Just use a tortilla instead of pizza dough. Add whatever toppings you want and microwave. It’s not THE healthiest thing in the world but satisfies the craving without being too super greasy or heavy on your stomach. That’s a great idea! I never would have thought to use tortillas for pizza. I am going to do this Friday with my gluten free tortillas so that I don’t have to make an extra shopping trip to get stuff for my crust! Zaya uses corn tortilla’s for pizza and black bean burritos, which I think are super healthy and yummie. He finds that it’s best to use 2 tortillas for it to hold better. Place mixture on half of flour tortilla and then fold over. For Corn Tortilla, I place 2 corn tortillas down and then cover the top one up entirely with my mixture. Isaiah likes his crispy, so I cook his 10 to 12 minutes. Note: I really don’t care for beans very much, but I really like this and it’s a quick and easy meal. Leftovers heat up well in the Microwave if you place a wet paper towel over top. 😉 Let me know if you try it. That sounds pretty good. I would like to try this because it uses the oven instead of a frying pan. I don’t like black beans by themselves but I do like mixed beans so I’d probably try that. I will let you know when I do!